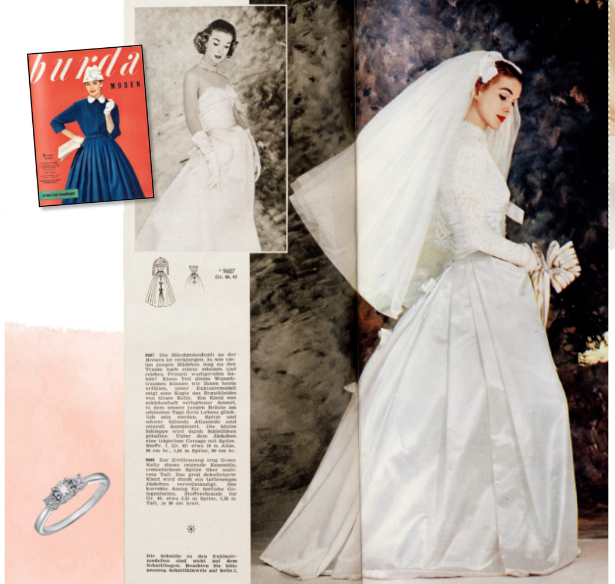 Grace Kelly’s stunningly beautiful bridal dress is adored with fascination even today – we’ve used its inspiration from 1956 as a modern choice for you to sew yourself! 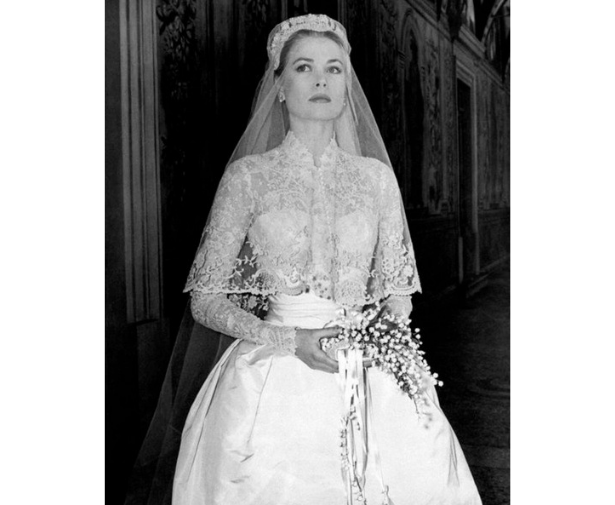 Grace Kelly on the day of her civil ceremony. 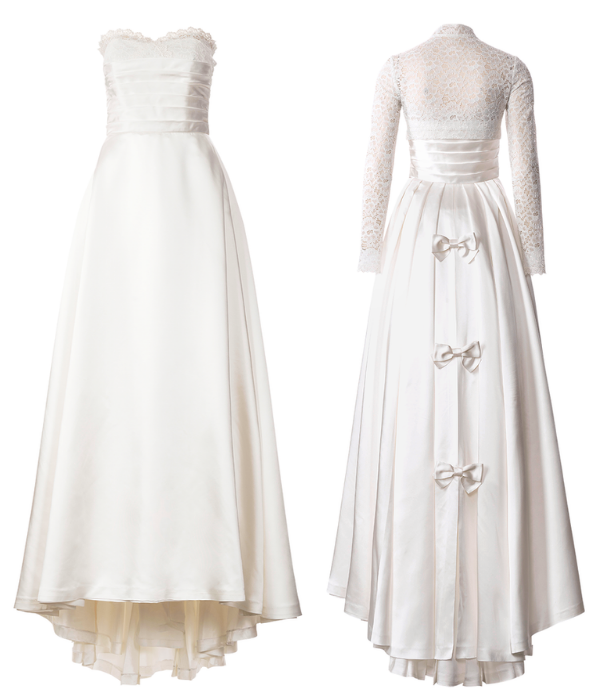 “The fairy tale wedding on the Riviera has happened, and also the realized dream of many young girls who imagine to f ind their own handsome prince.” We used these words to introduce the detail-rich interpretation of the still-beloved bridal dress of the time in our August 1956 issue: The gown that Grace Kelly wore to wed Rainier III and became Princess Grace of Monaco. 30 million television viewers watched with wonder as she arrived in the stunning work of art sewn with Rosaline lace from Brussels. 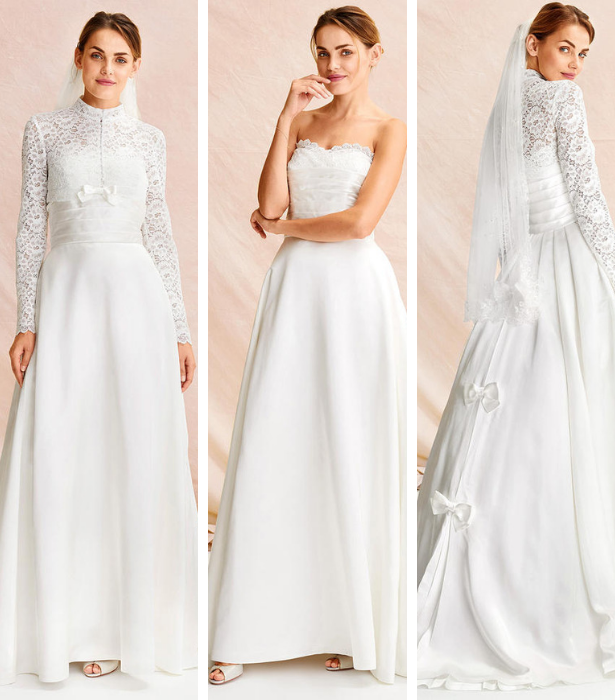 Choose the lace jacket or not, either way this super glamorous bridal dress has a princess vibe to make a most beautiful day be even more unforgettable. The corset bodice is accented at the bra cups with a delicate trim, the skirt with a light train that is decorated in back with sewn-on bows. See it featured in our Wedding Season Lookbook here! Tips & Tricks: In order to ensure that this dress sits perfectly and drapes with just the right precision, a skillfully sewn petticoat of tulle and sheer nylon is required as the rigid synthetic fibres hold the shape. The characteristic stiffness is important, as well as the ability to be flat and lightweight – extremely important because it must hold up to a full day of wear. This floor length slip skirt only covers the backside and the sides. The lower skirt panels that rest on the backside of the body, and the upper skirt panels with broad width and additional rows of gathered tulle, support to shape the lower skirt panel of the main dress. Diagonally topstitched satin bias bands enclose corsetry boning to additionally support a stable contour. Has anyone cut this pattern out? How many of each lining pieces do you need to cut? The instructions don’t specify!